Car matching description of attackers' vehicle being examined by security forces; more details emerge of attack. 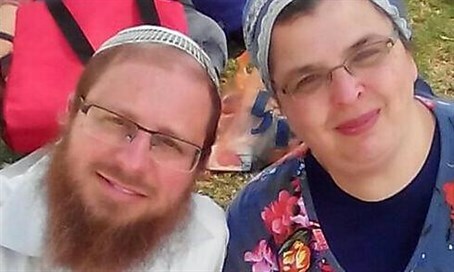 A father and son murdered by Palestinian terrorists near Hevron on Friday have been named as Rabbi Ya'akov Litman and his son Netanel. Their funeral will take place at 9:00 p.m. tonight. Meanwhile, Israeli security forces are examining a vehicle abandoned just south of Hevron, which they believe was used in Friday's deadly attack near the Hevron Hills town of Otniel. The shooting attack killed the 40-year-old father and his 18-year-old son, and left a mother and children wounded. It was carried out by terrorists in a car matching the description of the one discovered by forces in the Dura area.The family were on their way to a Shabbat Chatan celebration ahead of the wedding of one of the family's daughters, when a Palestinian Authority-plated vehicle overtook their car and opened fire on them. One of the terrorists then exited the vehicle and fired several more times at the victims' car, before the attackers made their escape. Netanel managed to alert security forces to the attack before being shot to death. His 16-year-old brother, who was shot in the leg, managed to direct emergency services to the scene, in an act of incredible courage.